I’m taking part in The Great Pick Up Line today at The Delighted Reader – using the line Simon uses when he meets Ben in ‘Shades of Sepia’. There’s also a draw to win an ebook from my back list. I’m at Kim Fielding‘s today as part of her Blast from the Past series, and blogging about why I chose to highlight Magic’s Muse. I’m hosting Anna Butler today on my LJ. Anna’s blogging about when scandal rocked London and her new release The Gilded Scarab. I’m blogging over at Writers Online Network today on their February theme of First Love or Heartbreak. My post is on First Love. 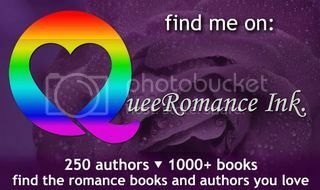 I’m hosting S.A. Ozment on my LJ today. SA is blogging about casting her characters, and is sharing an excerpt from her novel Illusions. I’m hosting Joe Cosentino on my LJ today. Joe is blogging about his new novella An Infatuation which will be released by Dreamspinner Press on 4th February.